If you’ve seen any old gangster movies, you’re probably familiar with the phrase: “Calling all cars, calling all cars!” It became a cliche for when police headquarters sent out an alert via radio. But radio hasn’t been around forever. And at the dawn of radio technology, there were some pretty goofy-looking devices anticipated for the policeman of the future. It can be difficult for people here in the 21st century to imagine a time when police couldn’t instantly communicate with each other across great distances. But that was the reality of police life before the 1930s. It wasn’t until the era of the Great Depression that police departments across the US started to widely adopt radios for their patrol cars. And forward-looking police departments even imagined that all cops would one day have radios attached to their person, like the illustration and photo above. 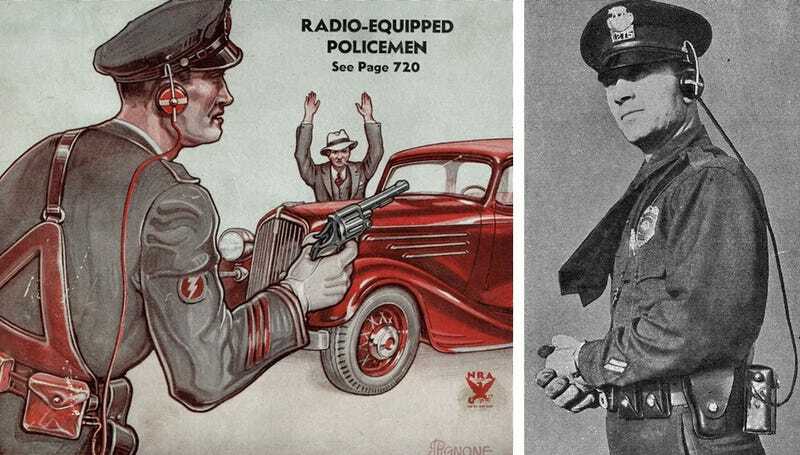 The June 1934 issue of Radio-Craft magazine included a cover story that showed exactly what this futuristic cop looked like—just as people were beginning to become accustomed to radio receivers in civilian cars as well. And while it’s clunky and awkward to us, it was the definition of high-tech crime-fighting for the people of the 1930s. “While, by this time, a radio-equipped car that receives its instructions, via radio, from headquarters is not new to our readers, radio receivers for motorcycle police and for the police-man ‘on beat’ will be a revelation to many,” writer R.D. Washburne explained in the 1934 article. Imagine a riot, bank hold-up, or what-will-you in crime, which is reported in time to police headquarters. As soon as the information is received it is immediately conveyed to the radio division of the police department where a dis- patcher broadcasts it (see Fig. A). His broadcast will be, in all probability— with the new set-up—, “Calling all officers, Section—(number depending upon location of crime), go to Main and Tenth streets, bank hold-up,” instead of the more generally-used phrase, “Calling car—(number),” that the all-wave or shortwave set owner is accustomed to hear. Further, imagine police cars, motorcycle police, and patrolmen (who will all be radio-equipped) racing to the scene of the crime, as per the broadcast instructions. With officers converging from every direction, what a slim possibility the criminal has of escaping capture! It was essential that the design of the set incorporate as few tubes as possible, the mechanical dimensions be as small as might be necessary, that provision be made for signal pick-up (antenna), that convenient housing be arranged for the necessary batteries which must supply “A” and “B” current, and finally, that the efficiency be of as high an order as required to obtain consistent and re- liable reception. These were design factors that had to be evolved, but in addition to the aforementioned, provision had to be made for portability (extreme lightness of weight, so that no physical interference would be experienced by the patrolman who carried it), and a fixed tuning arrangement so that no dial searching or twisting would be necessary. The article acknowledged that personal radios for cops might seem like overkill, but argued that it would eventually help police do their jobs better and catch more bad guys. It might be expected that those cities which are already equipped with radio patrol cars may not have any need for radio equipment of this type, but, as pointed out at the be- ginning of this article, where the radio-equipped patrolman serves as an adjunct to the radio-equipped car (and motorcycle), the possibility of apprehending criminals is tremendously increased. The following year, Radio-Craft magazine (published by legendary scifi author and futurist Hugo Gernsback) would make the case for two-way radios in all cars, not just police cruisers. But one big hurdle he recognized was that the FCC would have to dedicate spectrum specifically for this purpose. Even if there was some kind of consumer demand for all cars to have two-way radios—rather than the simple receiver-only radios which were just becoming popular—it would’ve required government action. But Gernsback did recognize the value of creating dedicated frequencies for emergencies, something that was ahead of its time. Of course, technology has done quite a bit for law enforcement in this decade (not always in the most ethical or legal ways), but it has also helped televise the systematic oppression of minorities in the United States at the hands of the police. Body cameras, while controversial, have given Americans a look at the ways in which police sometimes flagrantly plant drugs on suspects or commit unjustifiable homicide. But just because more and more police wear bodycams doesn’t mean that justice is necessarily served. Take, for instance, Stephon Clark, who was brutally killed in his own backyard by police who claim they thought he had a gun. His killing was captured on video and the police officers are not facing charges. Which shows that technology alone doesn’t necessarily solve anyone’s problems if policy doesn’t change as well.